The demo application starts with a duty cycle of 0, where the fan doesn’t rotate and increases the duty cycle by 5% every 5 seconds, until it reaches 95%. Then it decreases the duty cycle by 5% every 5 seconds until it reaches 0. It keeps repeating this sequence forever. At the same time it counts the pulses coming in from the fan’s tachometer output and displays the calculated speed every second. The circuit to drive the fan and to read the tachometer is really simple. 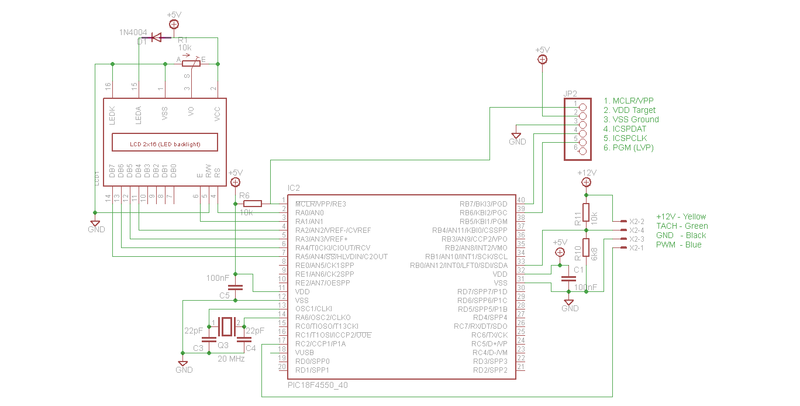 The microcontroller runs at 5 Volt and can directly drive the PWM input from a CCP output. The signal from the tachometer needs to be pulled up to 12V, after which simple resistor divider suffices to get that signal at the required TTL levels. The application is written in MPLAB X and uses Microchip’s xc8 compiler. The LCD module is borrowed and adapted from the “PC Case USB LCD” project by Simon Inns. The source is heavily commented so should be quite easy to understand. You can see that the fan starts spinning when the system is powered up, but that it doesn’t move at duty cycles of 0 and 5%. It does start spinning at 10%. I sincerely hope that this helps someone. This entry was posted in PIC projects and tagged 4-wire fan, MPLABX, PIC18F4550, PWM, xc8 by bart. Bookmark the permalink. Is there a maximum RPM that can be measured?, I’m looking to try it on some high speed fans which have 4 tacho pulses per second. Thanks. I don’t know how far you can stretch it, but the calculations I used are in the source code, so I would think it is a matter of filling in the numbers and to see if you can make them match your requirements. I would assume there to be plenty of room as the PIC I use is seriously over-dimensioned for my toy projects.